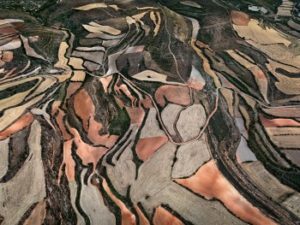 Given that the titles of two recent blog pieces of mine were ‘Salt’ and ‘Stones’ I couldn’t resist bring them together in a report on a photographic exhibition at Flowers Gallery, Hoxton, of the work of the Canadian photographer, Edward Burtynsky. 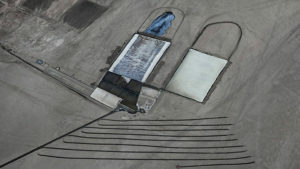 Burtynsky photographs manufactured, often industrial, landscapes, including elements like quarries, mines or rivers, within heavily industrialised complexes. This exhibition is of photographs which focus on the salt pans in Little Rann, of Kutch, India. There, over 100,000 salt workers harvest salt from the receding flood waters of the Arabian Sea, a way of life which has been in existence for over four hundred years. The salt pans are the vividly coloured rectangles, photographed by Burtynsky over a period of ten days from a helicopter. The landscape is usually a transient one, but it is becoming all the more so. Receding groundwater levels and the low market price for salt mean that this traditional activity is likely to cease altogether. The communities which depend upon it will also disappear. Burtynsky’s huge photographs are like pieces of abstract, geometric art, with their lines and flat patterns, but they are also real places and there are sometimes tell-tale, poignant signs of human occupation – a tractor, a little hut – which can only be seen up close to the photographs. 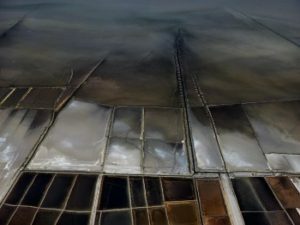 In addition, these landscapes show the history of the salt pans, the outlines and traces of old salt pan rectangles, dried out or drying out, which can be seen from the air but not the ground, so the photographs are, as the Gallery Notes describe, also a sort of palimpsest or record of time past. The photographs have a painterly quality to them, with mist, water or cloud blurring the image and capturing the light. One in particular brings to mind an old-fashioned tin palette of artist’s paints ( see above left ). 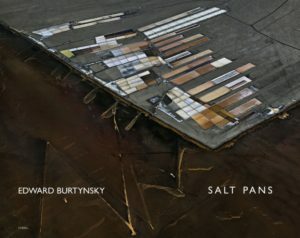 I liked them very much and I will look out for more work from Burtynsky, as well as exploring his ‘back catalogue’. You can do this, to an extent, by going upstairs to the first floor of the gallery to find a second show – ‘Essential Elements’ – which documents the photographer’s obsession with industrialised landscapes across the globe. Here there are works taken in China, the ancient landscape of which is currently being so industrialised, as well as other places. My favourite Burtynsky works are of dryland farming in Aragon, Spain ( see right ). I want this on my wall, although at about 34,000 Canadian Dollars I cannot afford even a limited run print. There are also some beautiful ‘abstracts’ of pivot irrigation reservoirs which I covet, but, again, out of my price range. Both are interesting and both are free. They are well worth a visit. 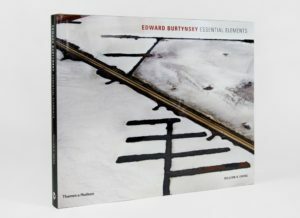 His books of photographs are on sale in the Gallery priced at £60 for ‘Salt Pans‘ ( Steidl ) and £45 for the new monograph on Burtynsky’s work by William A. Ewing, ‘Essential Elements‘ (Thames & Hudson, September 2016). Something rather more affordable for the ordinary purse and, as anyone who links on these links can see, somewhat cheaper on-line. The exhibition runs until 29th October at Flowers Gallery, Kingsland Road, Hoxton ( Hoxton overground is the nearest station ).